Read important information and follow the steps on this page if you are responsible for ordering compressed gas. Important: To ensure the safe use and storage of Class I, II, or III gases, contact the chemical safety officer, (858) 822-1579, before you order material. Note: Use Marketplace, UCSD's online buying site to order compressed gas. For liquefied gas, please see Liquefied Gas Overview. Gas sold in pre-filled cylinders: STORE through Marketplace offers a variety of compressed gases in cylinders. All rental, handling, and shipping fees are included in the price shown on Marketplace for customer convenience. Refills for customer-owned gas cylinders (COC): Cylinders are picked up and may take 1 to 3 weeks to be returned to the customer. If you do not see the item you need, please contact STORE to special order. Order your compressed gas from STORE through Marketplace. If you see the item you want, you can place your order. If you don't see the item, follow the instructions for specialty gas. In-stock gas can be delivered within 1 to 2 business days after you've placed the order. 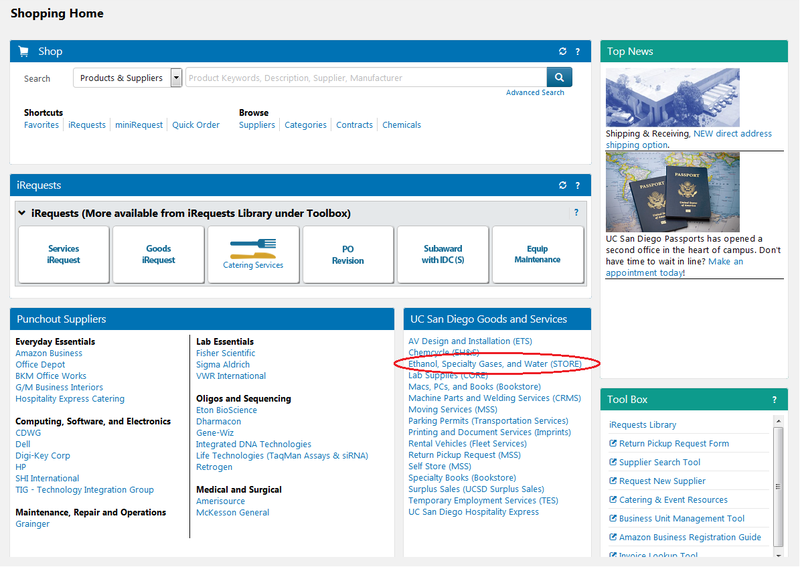 STORE's catalog in Marketplace can be accessed through the "Ethanol, Specialty Gases, and Water (STORE)" link on the Marketplace homepage. Order your specialty gas from STORE through Marketplace. Use iRequest:Specialty Gas and Cyclinder Hardware. Note: You may not return specialty gas for credit, unless the vendor has made an error. Contact STORE through ASK. STORE will process a pickup order for your empty cylinder. Customer-owned gas cylinders may take 1 to 3 weeks to be returned to the customer. Note: If you are considering purchasing a cylinder, contact us through ASK. To ask questions, request a service, or report an issue, call us at (858) 534-5650 or contact us through ASK (login required).